Nowadays when there is so much choice for the consumers it is more important than ever that packaging is attractive and eye catching. One product that I think does this very well is CLIPPER Tea. There are many features that appeal to me about this packaging and represents the brands position as ‘natural, fair and delicious’. The colours of the packaging vary with the different flavours of tea but all use a very limited pallette. Each product features black and white with three or four additional colours which are very natural and subdued, immediately evoking the feeling of relaxing with a cuppa. These colours are also very organic which cleverly promote the fair-trade aspect. I really like the use of illustration on the packaging. I feel these help the product stand out as a unique item on the shelf as there are not many others like it. CLIPPER makes use of simple silhouettes of teapots, teaspoons and of course cups and saucers. Decoration is then added with considerately placed tea leaves or flowers. I think the clear cut shapes are very effective at quickly conveying the product. The packaging also features serif font hand -lettering. I am a big fan of hand drawn lettering as I feel it portrays a product of high quality and makes it more personal. It makes the product seem like it has been created with more care and consideration. Furthermore I think the hand lettering makes it clearer that a person has actually carefully designed the packaging. The whole box is considered when being designed, including the back, sides and lid. 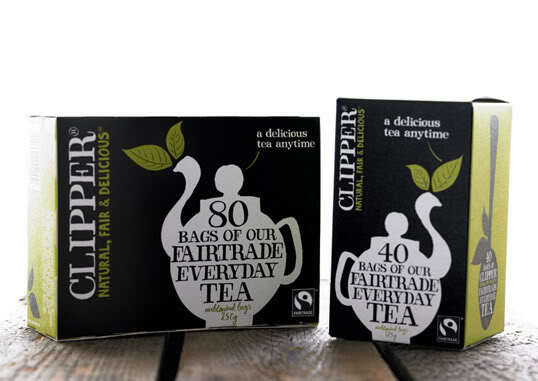 The CLIPPER tea boxes are created so they look attractive from all angles and become a well finished design. 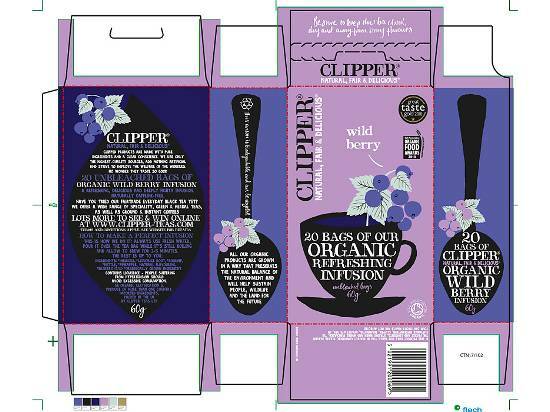 I think that CLIPPER teas are a very successful brand mainly due to the packaging designs. Their strong brand is reinforced by having a good continuity throughout all the products, which makes them recognisable and attractive. I myself love a good cuppa and am always drawn to CLIPPER teas… thankfully the tea inside is as pleasing as the box!